17th Sept 2012 ~ I was very excited last week and you know why ? last Friday was the very 1st time I started beading again .Ever since I moved out of Singapore 2 yrs ago and live here in erth Western Australia, I never had the time to teach again. I was so pre occuppied by errands and housechores after losing my ever wnderful helper who was always there to assist me when we were still in Singapore. So being in Perth doing everything had taken so much of my time that my beading had slowed down. 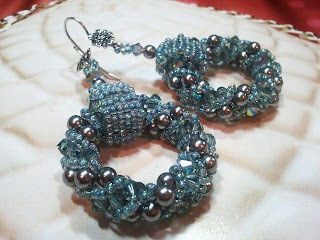 I had people asking me since last year to teach them how to bead and I keep promising them that soon i will start again once I have the time. Time had gone better these days since kids had grown up and able to manage a few things here and there. 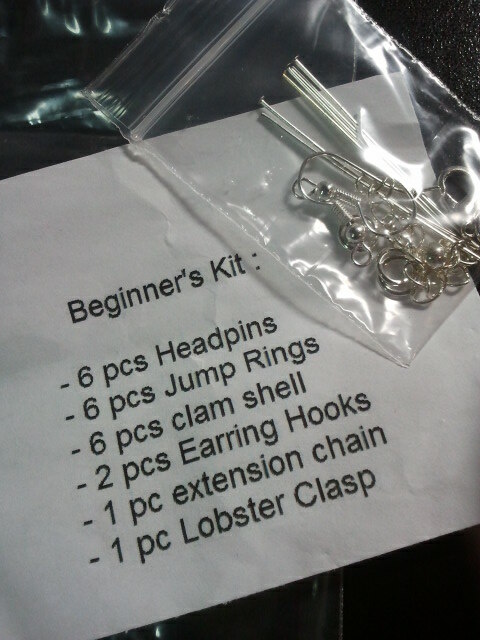 So now I'm happy i can sneak in some beading lessons in between during the weekdays when they are off to school. 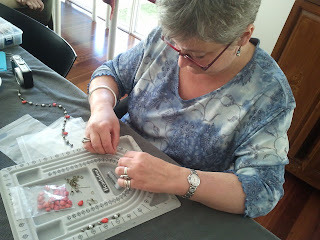 Last Friday ,9th of Sept was the very 1st day of my beading lesson in Perth held inside my home. I was so excited I even had the beads set up the night before just to make sure all is well prepared for the following day. I had improvised the venue by converting our dining area as the beading area where I had placed 2 extra tables covered nicely with a woolen cloth. 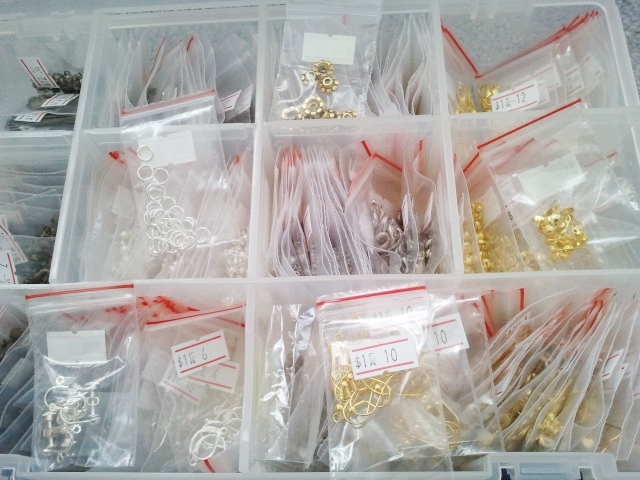 I had arranged the pearls, crystals and metal findings in bead boxes for easy selection on the projects they would make for the 1st time. 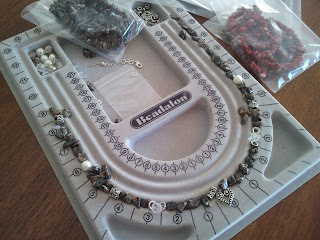 It's been over 2 years since I moved here in Perth and been so long time since I last had any beading student. 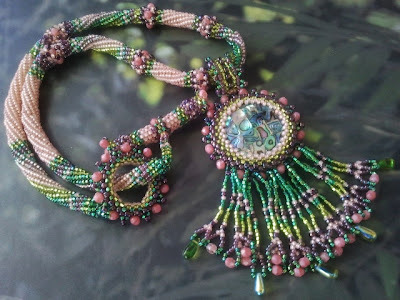 So to be able to share my knowledge of beading to some people once again is for me another new beginning and a new hope , a new door opening to greater opportunity here in Australia. My first 3 Perth Students came from 3 different nationalities. Karen an American and Wanne from Holland & Fiona also another European. They never had any beading lesson prior to our lesson so they were very excited to bead for the 1st time too. They are familiar faces to me because I knew them from the international school where all our kids go. 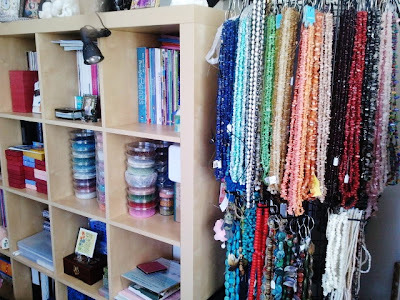 It was funny on how we started the morning by going up to my beadroom to look at some raw materials on the 2nd floor of our house.The main purpose of going up there was to simply have a quick look of what I have stored in there. Karen & Wanne were so amazed upon seeing my range of beads as well as the finished projects I'm about to put on display in my upcoming Gifts Fair event in October 28th, 2012. Their eyes were in circles like kids in a candy store. 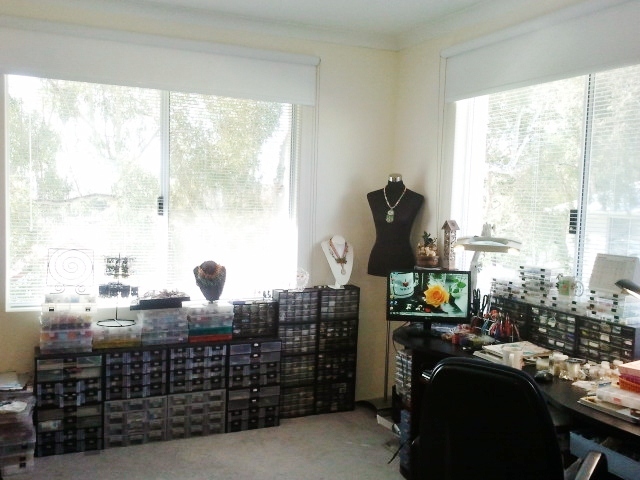 Well, that happens all the time when I have visitors in my beadroom ha ha . 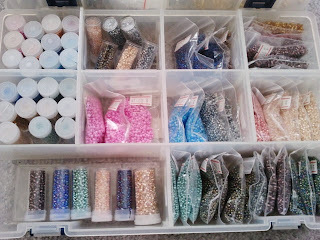 But anyways, I can say that wandering and looking at beads in my beadroom took a much longer time than the beading session itself. Oh well , but we all had fun giggling in there all the time. So, the beads were finally handpicked & sorted out. 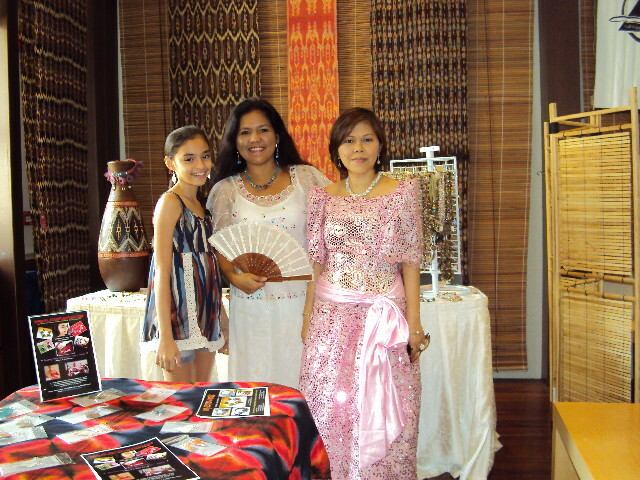 They had chosen their preferred style and design and the beading started with some coffee and a bit of pastries on the side. They were able to learn the use and importance of having a beadboard at 1st and a little introduction to the tools and the metal findings needed to start a project with stringing. 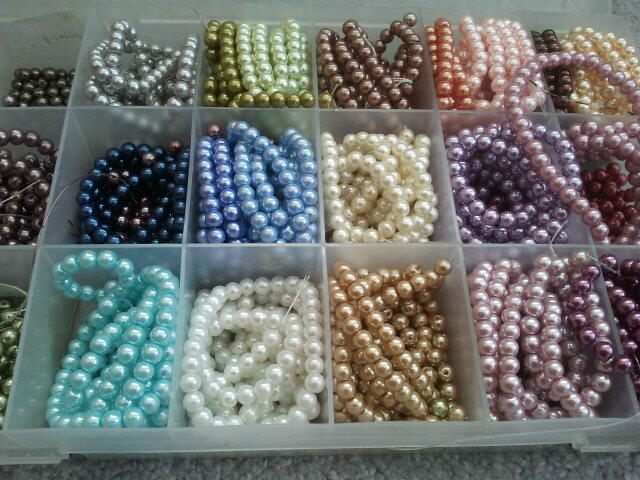 Beads arranged by Karen on her beadboard. The ladies being beginners without any beading experience at all were conscious and a bit tensed . Afraid to make a mistake but I assured them that there's no time pressure and they can work on their projects at their own pace and not to worry about being too fast or too slow compared to one another. Each person is different and has their own way of doing things. So no need to hurry themselves or to stress about not being able to catch up with everyone. I had encouraged them to do it slowly and make enough room if changes are needed. 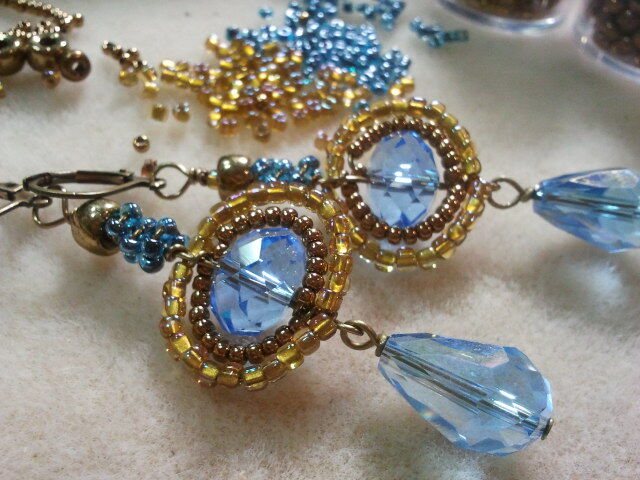 As soon as they got hold of their beads and started stringing, Wanne noticed that they became more relaxed after. Wanne is ready to string for the very 1st time with her selection of beads. 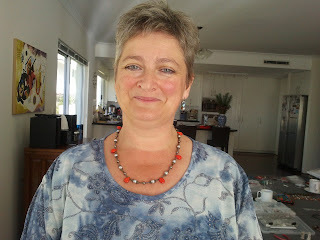 Wanne wearing her beaded necklace made with red coral, glass pearls & seed beads . Beading in fact is a good form of relaxation where a person's concentration flows freely within their minds gradually replacing any negative emotions or bad moods building up within themselves. It draws the mind out of those negative energies and replaces it with positive thinking and personal suppot whether mentally or physically. 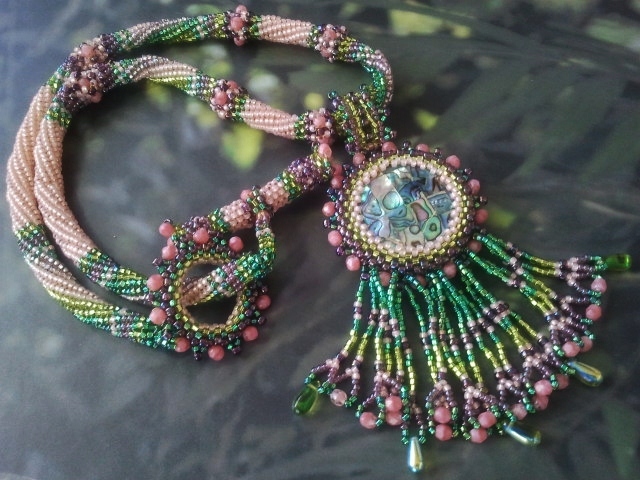 ﻿﻿﻿﻿﻿Talkin about beading as a form of personal support, this applies to the case of one of my beaders in Singapore ~ Bheng. She's a lady suffering from kidney falure thus having dialysis at home. She spent at least 10 hrs of dialysis in a day in her own bed . Laying down there looking at the TV all day long didn't make her happy at all. Until she met me and asked if I can teach her to bead so she can do something while her dialysis is on going. I immediately said yes to her request. She's one beader with great hopes and full of life despite of the fact that her physical condition didn't allow her tolive much longer. It was heartbreaking to see someone suffering the way she did but she had tried her very best to be positive and be an inspiration for everyone around her. 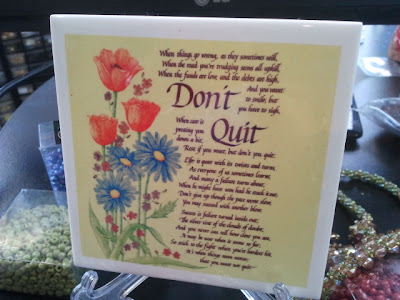 She created several pieces she had given to friends, sold some of the pieces as well and earned a bit for herself. Bheng , sad to say had succumbed to her illness recently. She's now resting in peace. Now I really found my reason to teach .. & to bead ! 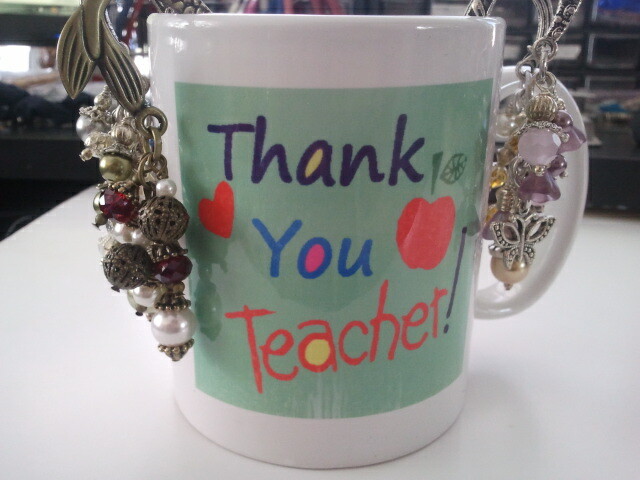 A gift mug I had received from one of my beading students in Singapore when I left for Perth in Aug 2010 . Sept. 1, 2012 ~ Oh wow,. 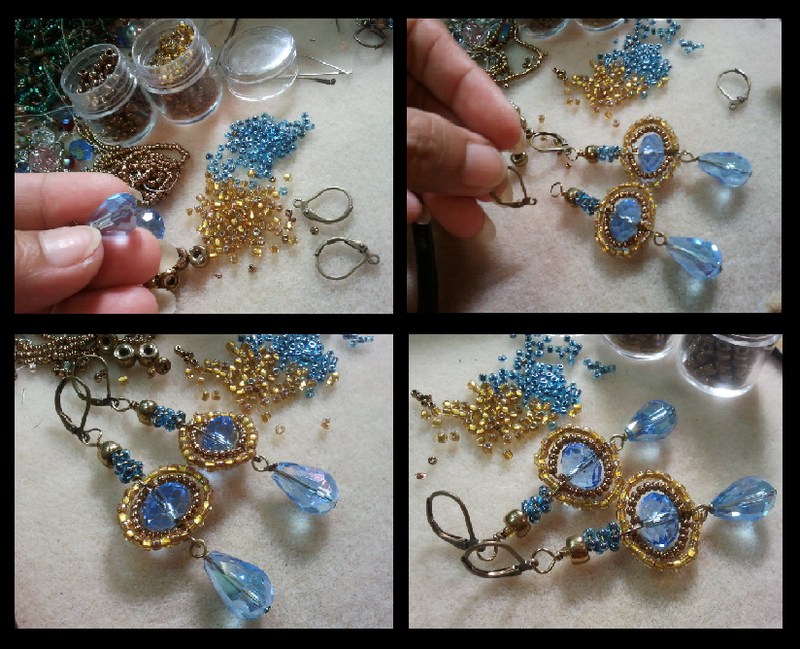 a new beginning of the month had just arrived and I'm so busy until these wee hours of the night writing this blog while at the same time finishing an earring by wire wrapping technique.. My fingers are now getting numb after the twisting and bending of the 22 gauge non tarnish Antique Bronze Artistic beading wire for several hours.. I had just discovered I had ran out of the 22 gauge in non tarnish silver so I better stick to the antique color for the meantime. Anyways, I'm here to welcome the month of September and try to find several things with reagrds to this interesting month. Do You have any idea what is the Birthstone for September? Giving a piece of jewelry containing a birthstone gem will bring the wearer with good luck and protection. Monthly birthstones symbolize the month of birth according to the Gregorian Calendar. What is the Birth stone for September? An old poem below provides the answer! some information about the meaning of the September gem stone, the color, symbolism and significance of this lovely birth stone can be read even more thru this link ~ Click here for the link to the said page ! The September birthstone poem reflects some of the properties with which the Sapphire is associated - truth, sincerity and constancy. The Traditional Metaphysical Properties for the September Birthstone Sapphire are clairvoyance, insight and interpretation. The healing properties of the September birthstone are reputed to be effective for health problems relating to lowering fevers and inflammation, hearing problems, cancer and burns. The Sapphire is also used to enhance the influences of Venus and and banish evil thoughts. 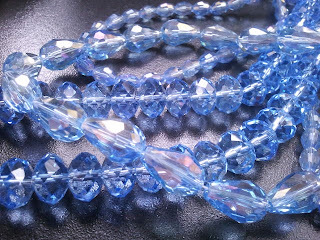 The word Sapphire is derived from the Greek word "sappheiros" which means "precious stone". 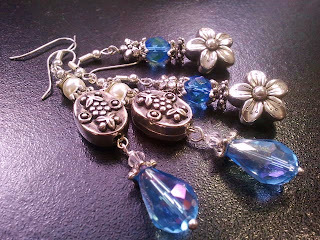 Sapphires are the blue transparent variety of corundum, highly prized as a gem. The Sapphire is a member of the Corundum (aluminum oxide) family. 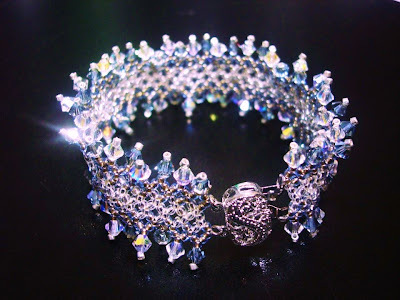 Crystal structure of the Sapphire, the September birthstone, is hexagonal (trigonal), dipyramidal. One of the four precious gemstones. The other three are diamonds, rubies, and emeralds. The traditional color associated with the Sapphire is the deep blue color and was strongly favored as a popular gem in jewelry. The meaning of colors through the ages represented many aspects of life. Social, religious, biblical and Christian symbolism were all reflected in the color blue. 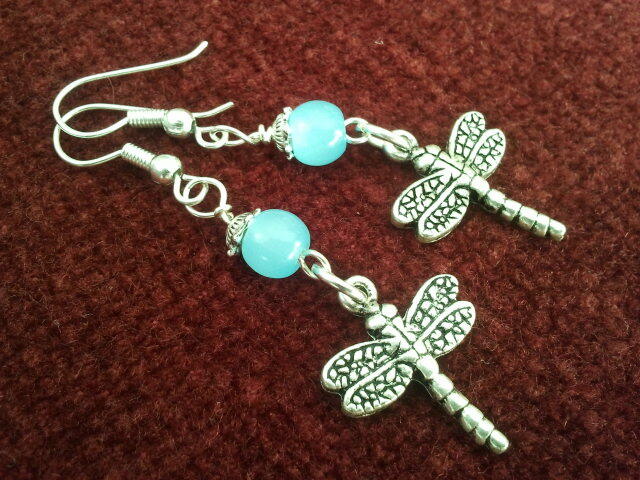 The symbolic meaning of the color blue has a Biblical meaning symbolizing heavenly grace. Sapphires can be found in a variety of colors, not just different shades of blue, these include yellow, pink and white. Sapphires with colors other than blue are generally referred to as fancy sapphires. The distinctive blue of the sapphire is due to minute amounts of oxide of iron and titanium in the stone. The September Birth Flower is the Aster, as shown in the picture below.